Grocery shopping can be a nightmare – trying to work out which food or drink is healthy and which is not. Most pre-packed foods have a nutrition label on the back or side of the packaging, which can help you choose between products. We’ve produced a handy card that you can keep in your wallet or purse to help you make healthier choices. 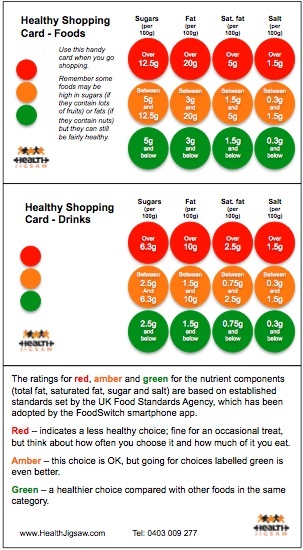 The ratings for red, amber and green for the nutrient components (total fat, saturated fat, sugar and salt) are based on established standards set by the UK Food Standards Agency, which has been adopted by the FoodSwitch smartphone app. Red – indicates a less healthy choice; fine for an occasional treat, but think about how often you choose it and how much of it you eat. Amber – this choice is OK, but going for choices labelled green is even better. Green – a healthier choice compared with other foods in the same category. Remember some foods may be high in sugars (if they contain fruits) or fats (if they contain nuts) but they can still be healthy. Andrew is the owner and principal trainer of Health Jigsaw. He is a highly sought-after trainer and has been a personal trainer since 1997. Andrew has previously worked in a five-star luxury resort, large fitness centres and an exclusive personal training studio.